Kickstarter changed things for creators. People who wanted to publish their own books and comics or produce their own web series didn't have to wait for someone to notice them or pour even more of their own cash into their projects, they could turn to crowdfunding. The platform allowed magic to happen. Backers and fans donate money - often essentially pre-ordering a product - and the support means creators can move forward with an art book or graphic novel or whatever it is they want to make. As much as I love and appreciate Kickstarter and funding models like it, the process doesn't allow for continuing support. Backing a single project doesn't always help my favorite creators keep going from month to month. Patreon fills that gap. Patreon lets fans provide ongoing support, like patrons. A creator sets up a page, and you can choose to give a certain dollar amount every month or by project. For example, geeky a cappella musician Peter Hollens has patrons per music video he creates. When he releases a video, he collects the funds. Different donation levels give you different access. For $1/video, Hollens provides access to his patron only stream. For $3/video, he'll provide announcements and news to you first and follow you on social media. The more money you donate, the sweeter the rewards. Worried that someone will use the per project model and make a bajillion things a month and end up costing more than you'd budgeted for? Don't worry, you can set a monthly limit. Using Hollens' model as a guideline, say you wanted to donate $3/video. If you want to support a maximum of 4 videos ($12) per month, you can set that limit when you sign up. I adore Patreon because I like the idea of setting aside $20 a month to divvy up among creators I want to support. When you're trying to make a full time living doing something creative, every dollar helps and everyone's contributions can add up. Even if you only have $5 a month to spare, it's helpful to creators, and I like that I can pitch in. One project I'm eyeballing right now is Travis Hanson's efforts to color his Eisner-nominated webcomic, The Bean. There are over 590 pages in the fantasy tale, and I'd love to see them all colored because Hanson is quite skilled in that department. But, as you can imagine, coloring that many pages takes time as does issuing new installments of the story. Hanson has his Patreon set up so for donations by pages colored and new pages posted. Again, you can set amounts and maximums you're comfortable with. 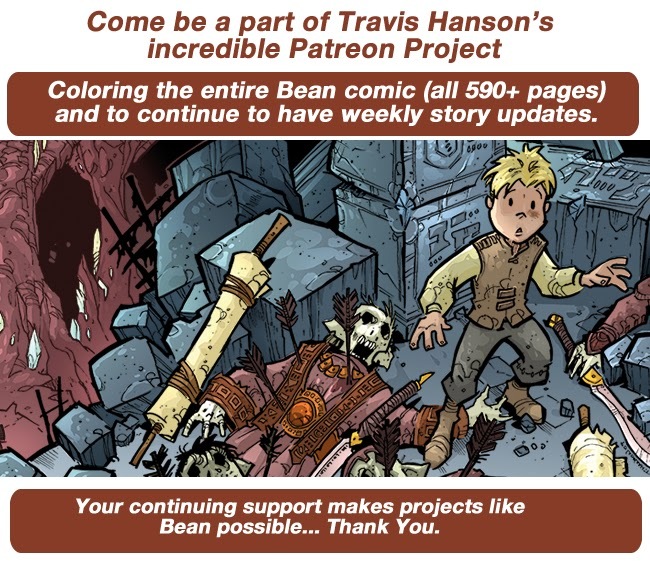 The rewards depend on money donated, but besides getting to see beautifully colored pages of The Bean, Hanson offers access to a secret Bean blog, a video/Google Hangout each month, and more. Do you support any creators on Patreon?